Tips for Hauling Heavy Loads With Your Intimidator UTV | Intimidator Inc. Whether you want to work or play, Intimidator UTVs are designed from the ground up to get you and your cargo where you want to go. From the Intimidator Classic Series to the Intimidator Truck Series, these machines can help make hauling cargo such as feed, hay, heavy equipment, and building materials a little easier, especially if you intend on carrying the cargo to a remote area. However, when it comes to loading up your Intimidator with cargo, there are a few tips to take into consideration to make sure that you and your cargo get to your desired location safely. 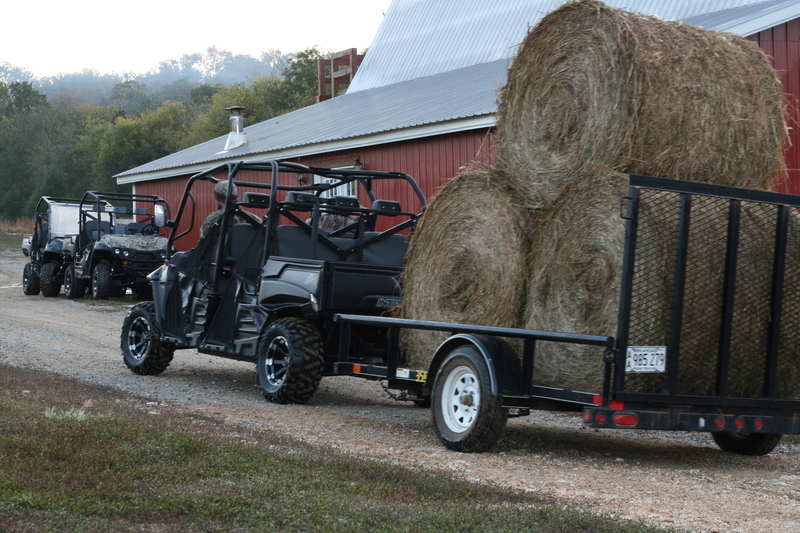 Intimidator UTVs were designed from the beginning to carry heavy loads in order to lend a helping hand. However, it is very important to know the cargo and towing capacity of your UTV. It is also equally important to know the weight of the cargo you're carrying or towing. For example, the Intimidator Classic Series has a 1,200 lb. cargo and 2,100 lb. towing capacity, the same as the Intimidator Truck Series. The Intimidator Crew Cab Series has a 1,000 lb. cargo and 2,100 lb. towing capacity. In addition to knowing the weight limit of your vehicle, it is also important to understand how your particular UTV, your equipment, and your terrain all work together. When you first begin towing or hauling, start with lighter loads. You want to get the feel of how everything works together in order to safely move your cargo from point A to point B. Whether you are towing or hauling a bale of hay or heavy equipment, it is very important to secure it and lock it down. If cargo is not properly tied down, then it can easily move around in the bed of the Intimidator vehicle or on the trailer you are pulling. When heavy items are allowed to move around, they can pose a problem. Large or heavy items constantly shifting can make it difficult and even dangerous as you move through unlevel trails and terrain, so it is always best to double check and tighten down your cargo. Intimidator UTVs offer a variety of engines to fit the needs and wants of our customers. From the 40-volt Brushless Electric to the 1000cc Kohler Diesel to Intimidator’s own 800cc Gas Engine, Intimidator has you covered. However, when you are hauling or towing heavy equipment, it is very important to slow down. The heavier your cargo, the slower you need to go. If you need to come to a quick stop, like when a deer jumps in front of your UTV, you will be able to do so safely if going at a slower speed. Whether you are a farmer who needs to move hay throughout several acres or you need to move equipment through rugged and remote areas, Intimidator UTVs can help lighten your workload and get your cargo carrying jobs done quicker. Intimidator UTVs are built to handle heavy loads with their automotive precision and quality 10.25” slip-on brake rotors with dual piston calipers and four-wheel independent suspension. However, when handling large loads and dirt and rocky roads, it is important to take extra precautions to stay safe. Check out all of our vehicles at Intimidatorutv.com and learn more about how Intimidator UTVs can be a big help when it comes to moving heavy objects.